What does the term ‘Full Mouth Restorations’ mean? Full Mouth Restorations refer to various dental treatments that are aimed at restoring the function and aesthetics of multiple teeth in the mouth. These are mostly cosmetic procedures that not only rehabilitate structure and function, but also make the smile more aesthetically pleasing. What are the different treatments that fall under Full Mouth Restorations? A Dental Implant is the best, most effective means of replacing a missing tooth in the arch. The implant surface integrates with the surrounding bone, thus strengthening the bone and preventing it from resorbing. It looks and feels completely natural, and offers better strength and support than a real tooth. This way, a dental implant addresses all aesthetic and functional needs of a tooth, and can replace multiple teeth in the mouth. At Anantuni Family Dental, we also offer implant retained dentures that eliminate all problems and inconveniences associated with denture-wearing. Dental Veneers are fine, tooth colored, shell like restorations very common these days in cosmetic dentistry. They offer a complete smile makeover by effectively masking most dental imperfections and defects such as gaps, discoloration, size variations and uneven margins. These shells are bonded onto the surface of the tooth for a full mouth restoration. Countless celebrities opt for dental veneers as an easy, effective way of transforming the smile to make it look absolutely flawless. 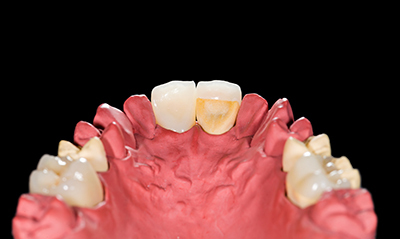 Dental Crowns are tooth colored caps that are used to cover a tooth with a compromised structure or appearance. They prevent a Mouth restoration plantooth from further damage and loss of structure, while simultaneously restoring its function and aesthetics. Crowns are fabricated exactly according to the natural shade and morphology of the tooth to ensure complete biocompatibility and harmony. Dental Crowns are indicated for root canal treated teeth, fractured teeth, teeth that have been damaged by wear, permanently discolored teeth and teeth that have lost significant structure due to caries. Dental Bridges are used to replace missing teeth in the upper and lower arches. They can effectively replace either a single tooth or multiple teeth in the same arch by using the support of natural teeth adjacent to the empty sockets. Dental Bridges, unlike implants, only offer superficial replacement of missing teeth and do not involve the bone or surrounding tissues. These can be fabricated to match the color of the tooth, and are then fused to metal for optimal support and strength to withstand intra-oral forces. Composites are considered to be the dental filling materials of choice by countless leading dentists across the globe including the restorative experts at Anantuni Family Dental, Chandler, AZ. These tooth colored restorations offer impeccable strength, aesthetics, biocompatibility, structural stability and versatility. They can be used to restore any tooth in the posterior or anterior region of the mouth effectively. Unlike a few conventional dental restorative materials, composites do not contain potentially toxic substances, or undergo shrinkage and discoloration. They can be used to restore multiple teeth during the same visit, and can also replace previous amalgam (metallic) fillings. At Anantuni Family Dental we offer a complete range of full mouth restorations to give you the perfect smile makeover. Book an appointment with us today on 480-821-4000 and experience the difference with the leading dental team in Chandler, AZ!